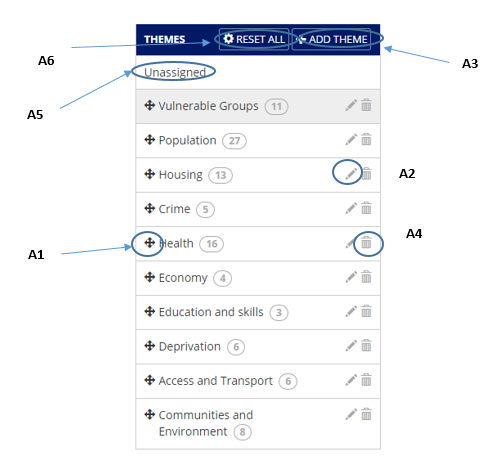 Organise your themes according to your organisation’s current strategic priorities. Display the indicators that you need on the map. In the admin tab, scroll down to ‘Manage themes’ and give it a click. If you haven’t used custom themes before, you will see a ‘Start using custom themes’ button. Go ahead and give that one a click too. Change the order of the themes (see A1). These changes will immediately be reflected on the maps page and the dashboard. Add in completely new themes (see A3), and delete unwanted themes (see A4). If you delete a theme that holds some indicators within it, these indicators will be moved to the Unassigned category (see A5) and will not appear on the maps page or on the dashboard. However it is easy to drag them into new themes. As we add new indicators to the system, they will first appear in the Unassigned category, so that you can allocate to the appropriate theme. You can revert back to default themes and indicators through clicking the Reset All button (see A6). When using custom themes, you can choose which theme indicators appear in & also the order, including any custom datasets you have imported using Upload your data. This is controlled through the indicators and custom data box on the right hand side of the screen (see Fig B). Move indicators around within a theme to change the order that they appear in on the map. Change which theme indicators appear in, by dragging and dropping indicators into any theme you wish. You can also move your custom data sets around themes. These are indicators that you have uploaded yourself. 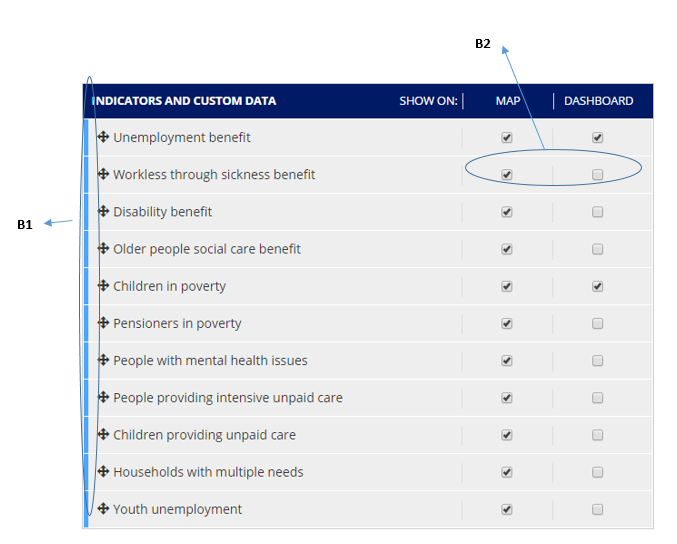 Custom datasets are differentiated from the standard indicators in Community Insight through the coloured tab (see B1), which is orange rather than blue for custom datasets. Empty themes will not display on the maps page or the dashboard. You can have an unlimited amount of indicators on your dashboard. Custom datasets currently do not appear on the dashboard, but do on the maps. Indicators that are Unassigned cannot appear on the maps and dashboard. You’ll just need to move them into a different theme.